Part One opened up the topic and introduced the simple “billiard ball” or zero-dimensional analysis of the earth’s climate system. The sun radiates “shortwave” energy which is absorbed in the atmosphere and the earth’s surface. This heats up the earth’s climate system and it radiates out “longwave” energy. The longwave energy gets significant absorption from water vapor, CO2 and methane (among other less important gases). This absorption heats up the atmosphere which re-radiates long wave energy both up and back down to the earth’s surface. It is this re-radiation which keeps the earth’s surface at around +15°C instead of -18°C. Part Two looked at why different gases absorb and radiate different proportions of energy – what the factors are that determine the relative importance of a “greenhouse” gas. Also why some gases like O2 and N2 absorb almost nothing in the longwave spectrum. The Part Three introduced Radiative Transfer Equations and finished up with a look at what is called the gray model of the atmosphere. The gray model is useful for getting a conceptual understanding of how radiative transfer creates a temperature profile in the atmosphere. However, part three didn’t finish up with enlightenment on the complete picture of CO2. The post was already long enough. In this post we will look at “band models” and explain a little about saturation. Many decades ago when physicists had figured out the radiative transfer equations and filled up books with the precise and full derivations there was an obvious problem. There was clearly no way to provide an analytical solution to how longwave radiation was absorbed and re-emitted through the atmosphere. Why? Because the actual absorption is a very complex and detailed function. The precise structure of the absorption is also affected by pressure broadening as well as a couple of other factors. So long before powerful computers were available to perform a full 1-d model through the earth’s atmosphere, various scientists started working out “parameterizations” of the bands. What does this mean? Well, the idea is that instead of actually having to look up the absorption at each 0.01μm of the longwave spectrum, instead you could have an equation which roughly described the effect across one part of the band. Goody in 1952 and Malkmus in 1967 proposed “narrow band” methods. Subsequently others proposed “wide band” methods. Later researchers analyzed and improved these band paramaterizations. Without using these parameterizations, even today, with very powerful computers, it is weeks of computational time to calculate the 1-d radiative transfer function for the atmosphere for one profile. It’s important to note that the parameterizations can be tested and checked. Kiehl and Ramanathan did a big study in 1983 and showed that many of the models were well within 10% error compared with the detailed line by line calculations. Looks ugly doesn’t it? But it makes the calculations a million times easier than the detailed spectral lines all the way from 4μm up to 30μm. The first term, TΔν, is transmittance – it’s just how much radiation gets through the gas. Let’s explain the equation and what it means for saturation. First of all what are the variables? TΔν – is the transmittance in the spectral interval Δν. Transmittance is the fraction of radiation that passes through: 0 – no radiation gets through; 1 – all the radiation gets through. 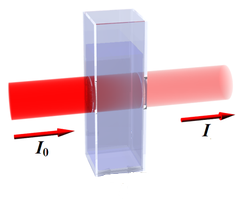 By the definition of Transmittance,TΔν = e-χ, where χ is optical thickness. It’s the Beer Lambert law that we already saw in part three. Well, even the tricky band model equation can be simplified.. But we couldn’t properly evaluate the expression because the absorption variable was a complex function of wavelength. Ok, not too easy to immediately see what is going on? But S, δ and α are constants for a given absorbing gas.. The optical thickness, in the strong condition, is proportional to the square root of the amount of the absorber. If you skipped the maths above, no one can blame you. And what were the weak and strong conditions? They were mathematically defined, but keeping it non-technical: weak is “not much” CO2 and strong is “a lot” of CO2. But we can say that in the case of CO2 (in the 15μm band) through the troposphere (lower part of the atmosphere) it is the strong condition. And so if CO2 doubled, the optical thickness would increase by √2 (=1.4). Simple? Not exactly simple, but we made progress. Before, we couldn’t get any conceptual understanding of the problem because the absorption spectrum was lots of lines that prevented any analytical formula. What we have achieved here is that we have used a well-proven band model and come up with two important conditions that allow us to define the technical meaning of saturation – and even better, to see how the increasing concentration of CO2 impacts the absorption side of the radiative transfer equations. But it’s not over yet for “saturation”, widely misunderstood as it is.. Remember that absorption is just one half of the radiative transfer equations. Before we finish up, optical thickness isn’t exactly an intuitive or common idea, and neither is e-√χ. So here is a idea of numerically how transmittance changes under the weak and strong conditions as the concentration increases. Remember that transmittance is nice and simple – it is just the proportion of radiation that gets through the absorbing gas. 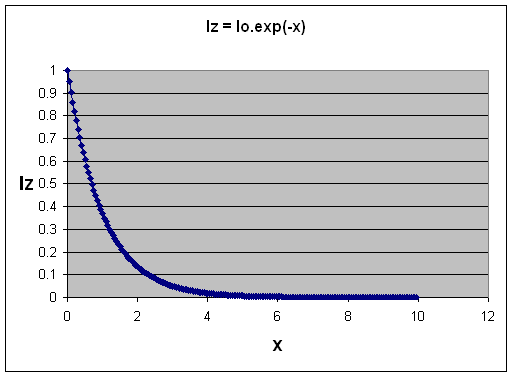 Suppose our optical thickness, χ = 1. Note: these numbers are not meant to represent any specific real world condition. It just demonstrates the kind of change you get in the amount of radiation being transmitted as the gas concentration increases under the two different conditions. It helps you get an idea of e-χ vs e-√χ. Assuming that a few people would want to know..
To carry out the full 1-d radiative transfer equations vertically through the atmosphere climate scientists usually make use of band models. They aren’t perfect but they have been well tested against the “line by line” (LBL) absorption spectra. Because they provide a mathematical parameterization they also allow us to see conceptually what happens when the concentration of an important gas like CO2 is increased. We can calculate the transmittance or absorptance that takes place. It helps us understand “saturation” – which we have done by looking at the “strong” and “weak” conditions for optical thickness. This term “saturation” is widely misused and conveys the idea that CO2 has done all its work and adding more CO2 doesn’t make any difference. As we will see in a future part of this series, due to the fact that gases that heat up also radiate, adding more CO2 does increase the radiative forcing at the surface – even if CO2 could have no more effect through the lower part of the atmosphere. Well, that’s to come. What we have looked at here is some more detail of exactly how transmittance and optical thickness increase as CO2 increases. The next post will look at the 1-dimensional model results..
Nice post. Are you going to gather all four parts together in one place and top and tail them so it can be read as one article? on February 5, 2010 at 3:32 pm | Reply Tim W.
Keep posting! Your efforts are greatly appreciated. I’m still “absorbing” it all. Probably some questions to come. . . I may get bored when we get to part 999 (have you any idea just what you have started here…! ) but for the moment – thanking you for a very coherent and interesting read. Regarding the figure ‘From “Handbook of Atmospheric Sciences”, Hewitt & Jackson 2003’ shouldn’t absorptance be the inverse of transmittance (assuming no reflection)? And the prize goes to Lynn E..
Great to see someone actually reads and checks the details! You are correct. They got their graph wrong. Eagerly waiting for an update on the discussion on what happens after saturation. Can you explain a little more what you are looking for? Your excellent posts on atmospheric modelling give rise to a speculative thought. AFAIK water vapour does not affect the albedo, but droplets of condensed water in suspension (i.e. clouds) certainly must do. I remember reading that cumulus clouds are the next brightest thing to the sun, so they must be very good reflectors. So it might be possible to set up the model to produce the amount of albedo increase required in order to produce a no warming effect from a doubling of CO2. And then a set of assumptions should get a rough idea of the amount of increased cloud cover that ought to be observable, in this case. Do you know if anyone has done this kind of investigation? I’ve seen that discussion touched on in a few places. It’s a good question, and hopefully something that will get addressed on this blog. When I came to know this blog this series was already too long for me. Now I see it’s definetly worth the time of reading it. Very instructive. Thanks again for the great work and generosity. One question: one professor called Modtran a line-by-line model. But it takes only a few seconds to run in its online version. So is it really a band model? This means, it is not LBL “line by line”. Then it is indeed a band model. Dig into the “saved” data from a run and it lists the bands and a LOT of very insightful, if a little arcane, data. The bands are on 2/cm wavenumber centres from 100/cm (100 microns) to 1500/cm (6.667 microns). The saved data is very rich and includes just about everything of interest. Transmittance, absorption, path length radiance, mole densities by height, etc. Also the ability to view at different heights (both up and down) allows insight into such questions as energy balance by layer. All in all a very useful bit of kit. CO2 is less the 0.5 deg K/doubling. Miskolczi also gives considerable data showing that this is a correct value..
What does he put forward to show that the atmosphere has a constant optical depth? radiosonde measurements i believe… i have no idea as to the validity o these claims mind. This lil slide show was all i could find that documents it mind. Id be interested in your take on it all… i slaved my way through his paper years ago… And came to the definite conclusion it was well above my head. Have the band models been verified experimentally? In my dreams, someone will shine a giant variable-wavelength infrared laser at a detector in space and obtain an actual spectrum of the infrared absorption of the earth’s actual atmosphere. The laser would need to be able to compete with “earthshine” at infrared wavelengths, totaling about 240 W at all infrared wavelengths. Such an experiment would demonstrate whether or not these extremely complicated calculations are correct. Since the temperature of the atmosphere and the height of the tropopause vary with latitude, one would like to place the laser in different locations. By looking at different wavelengths, one could determine which components in the atmosphere were or were not behaving as predicted. on December 17, 2011 at 6:06 am | Reply Mark O.
Frank … I think much the same thing. It must be a powerful CO2 laser, and it must be shone upwards at night, so that there is almost no earthshine. Then we can parse the data on a satellite and see if the AGW group is right. Have the band models been verified experimentally? Well, the calculations of absorption and emission in the atmosphere – the radiative transfer equations – using the “line by line” method have been verified against many experiments (e.g. see CO2 -Part Six – Visualization ). And the band models have been verified against the “line by line” calculations. For example, in the reference given in the article.